Sita was out of the office the day I took the group photo at FTG Nepal. But there is no escaping the sprawling photo documentry that is my trip to Nepal! 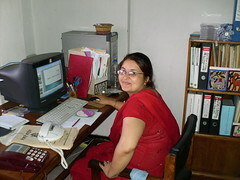 Sita Gautam Acharya is the Assistant Coordinator at FTG Nepal. And she went home with a cold yesterday. I hope you’res feeling better, Sita-ji! I was on vacation for the past two weeks and only now caught up with your blog. It sounds like you had an amazing adventure! We’ll have to touch base once you’ve recovered from flu and jet lag.